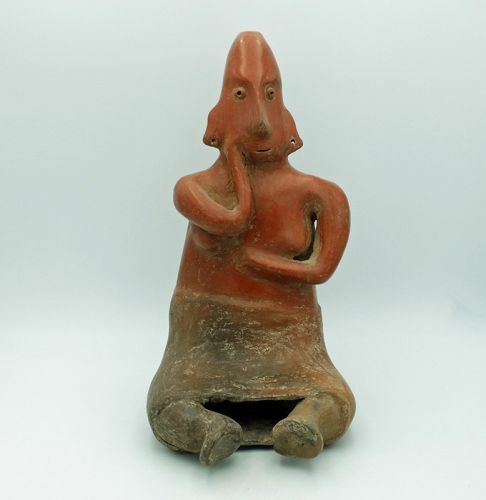 A lovely Colima figure from West Mexico, ca. 300 BC – 300 AD. This choice two-tone female is 12-3/4” high and is posed seated, with one hand held to the side of her face in a thoughtful gesture. She is attired with a long skirt and her elongated ears are pierced. In exceptional condition, with highly burnished slip and good mineral deposits. A nice Moche III portrait head from Peru, ca. 200 - 450 AD. The vessel is 9-1/2" high and depicts a specific individual with distinct and strong facial features used to depict a specific individual, who has small, paint enhanced ornaments molded into the ears. The red clay was at one time completely painted with a thin layer of highly burnished red slip, which has minor deterioration in a few areas. An excellent example. 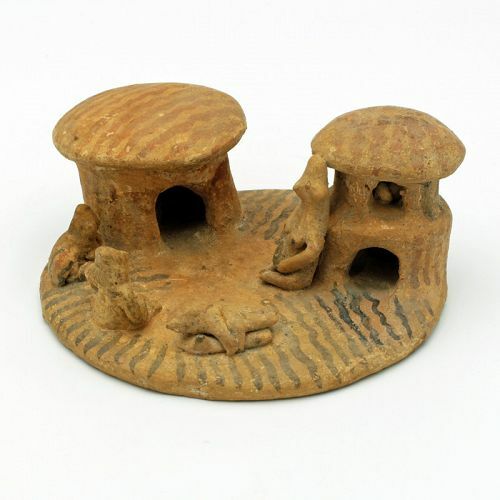 An adorable Colima avian vessel from West Mexico, ca. 250 BC – 300 AD. 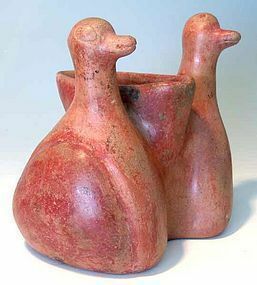 This wonderful Comala style effigy vessel is 6-1/2” high, 7” wide and depicts a pair of conjoined ducks. They are nicely detailed, with wings on the sides and two-tone red slip. An excellent example of the type, highly burnished, with nice mineral deposits evident. Cf. Townsend “Ancient West Mexico”, page 209, for similar. An exceptional Chimu wood staff from Peru, ca. 1100 – 1450 AD. This rare example is 22-1/2” long and features a nicely detailed head topped with a large flared element. The carving is surrounded by multiple bands of delicate pyro-incised designs. In superb condition, fine patina, mounted on stand. A superb Colima bowl from West Mexico, ca. 300 BC – 300 AD. This choice Comala phase example is 7-1/4” in diameter and is decorated with a trio of serpents, executed in relief. The slip is highly burnished and shows good mineral deposits, with strong calcification on the inside.